DePuy Spine, Inc. chose the 80th meeting of the American Association of Neurological Surgeons (AANS) at which to announce the launch of the VIPER® F2 Transfacet Pedicular System. 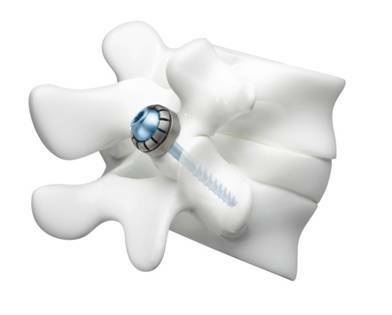 VIPER® F2 is a transfacet pedicular screw and polyaxial ring system designed to provide stabilization and fixation during degenerative lumbar spinal fusion procedures. According to the American Academy of Orthopaedic Surgeons (AAOS), about 300,000 Americans have spinal fusion surgery each year. During the procedure spine surgeons strive to achieve rigid fixation and compression of facet joints, the joints that link vertebrae together and give the spine its flexibility. VIPER F2 consists of large diameter lag screws and fully functional polyaxial rings, designed to provide optimal fixation. The screws are inserted bilaterally through the superior side of the facet, across the facet joint and into the inferior pedicle. Polyaxial rings increase the load bearing area of the screw that is in contact with the bone. The VIPER F2 may be used in either traditional or minimally invasive spinal fusion surgery. The announcement of the launch was made at the 80th Annual Scientific Meeting of the American Association of Neurological Surgeons (AANS) where DePuy Spine is showcasing its portfolio of minimally invasive and traditional surgical instruments and implants for the treatment of a wide range of spinal pathologies and conditions.